GameChange Genius Tracker™ currently being installed in Minnesota. 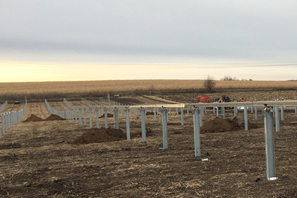 NEW YORK, NEW YORK – December 1, 2017 – GameChange Solar today announced that as developers seek to enhance LCOE, there is a growing trend towards trackers being installed in northern states. The challenges of land constrained sites can be offset with tracker designs which maximize panel density by both individual row power so spaces between trackers are eliminated versus central drive trackers, and by packing panels all the way down the trackers so minimal space is wasted (such as the GameChange Genius Tracker™). These designs work better with difficult array shapes and also allow for more installed DC capacity with sufficient GCR, wider row spacing, or a combination of the two; key factors contributing to a substantially increased LCOE for project owners. Developers should also take heed of the harsh cold and snow conditions prevalent in the Northern states in considering use of a tracker system. The rugged design and conservative engineering behind the GameChange Solar’s Genius Tracker™ combined with advanced tracker technology, such as a snow sensors, have made GameChange a logical choice for risk averse design engineers. GameChange’s extensive experience engineering foundation solutions for hundreds of megawatts of fixed tilt systems since 2012 in frost jacking susceptible areas has also been a critical consideration for developers and EPCs in selecting GameChange as their best partner for tracker solutions in northern states.